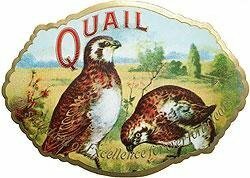 Quail Outer Cigar Box Label. Vintage, original, unused label from the 1910s is nicely embossed with image of two (2) quail with gold trim. Quail Outer Cigar Box Label. Vintage, original, unused label from the 1910s, is 4" x 5.5", die cut, nicely embossed, image of two (2) quail with gold trim.